The fifth annual WSC national conference was held in New York City at the Microsoft Technology Center on August 1-4, 2018. Multiple WeWork venues in midtown Manhattan were also utilized for breakout sessions. 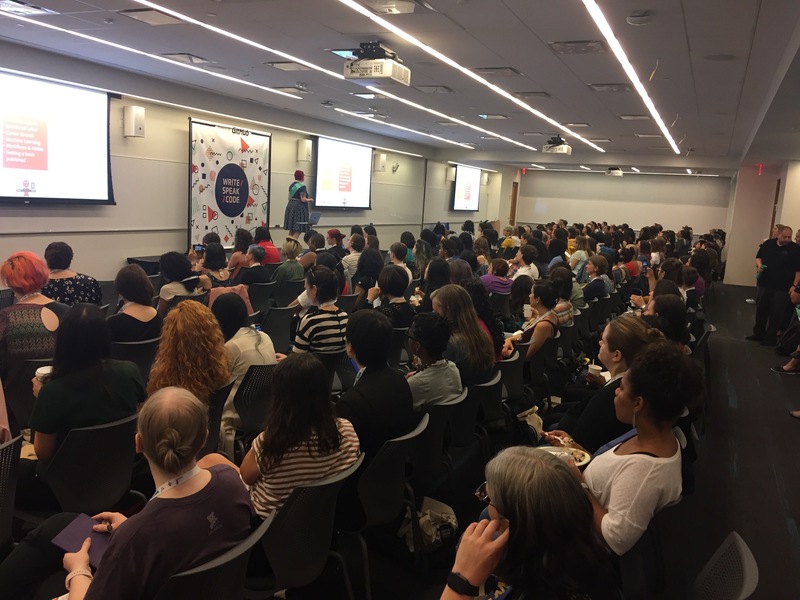 About 300 women and non-binary people in tech attended. Conference tickets are priced from $75 to $600 for the 4-day conference. These registration fees only represent a fraction of the actual cost of the conference. This conference was organized by dozens of people (“volunteers”) who gave hours (days and weeks) of their personal time to make the conference possible. Sponsors also donate to cover the cost of venue, food, childcare, scholarships, sign language interpreters and more. All conference slides are available on GitHub. The talks were not video-recorded. While reports and laments of lack of diversity in tech are plentiful, actions that propel change are more meaningful and helpful. The conversation in tech has recently been in acknowledging the problems: Silicon Valley and throughout the nation on sexual harassment in tech, the diversity deficit in STEM fields, lack of advancement of women and underrepresented groups, the abysmal diversity statistics at the top tech companies. This group has explored what their needs are, examined how others are succeeding, have built an inclusive environment and encourage people to share their expertise and inspire and support others; their taglines are Own Your Expertise! and Speak Your Truth. emails were sent the day prior to any talks that were deemed “potentially triggering content.” Examples include topics of self-help, mental health, disability and others. This communication alone prepared us as well as being a general acknowledgment that many of the topics, including those of career development, could trigger difficult feelings. This was my first time attending a WSC national conference. I am grateful to have received one of the scholarships and that it was located in a venue that accessible to me. As someone who cannot eat dairy, I was thankful that there were appropriate food options available. Although it was generous of WSC to offer Lyft service for mobility impaired attendees to go to the outside venues, since I recently had ankle surgery, I chose to stay in the main venue at Microsoft and attend the Explorations Track. I attended as much of the conference as I was able to, with my ankle healing. I did not attend for all 4 full days and skipped the evening events. Since I live in New York City, I saw many familiar faces from the local meetup community. During many of the talks, we were asked to partner up to do exercises and encouraged to speak to someone new. As an introvert, I appreciated the nudge to meet and speak to others. I met amazing women and non-binary folks from Portland, Seattle, Chicago, Toronto, St. Louis, Boston and more. I met a few data scientists, but primarily the attendees were developers and software engineers. It was advantageous to expand my network and meet so many inspiring and ambitious coders from all walks of tech. I learned about topics that we don’t even touch upon in data science such as mentorship and asking for feedback. Getting Feedback: from co-workers, that is Actionable, Specific and Kind. 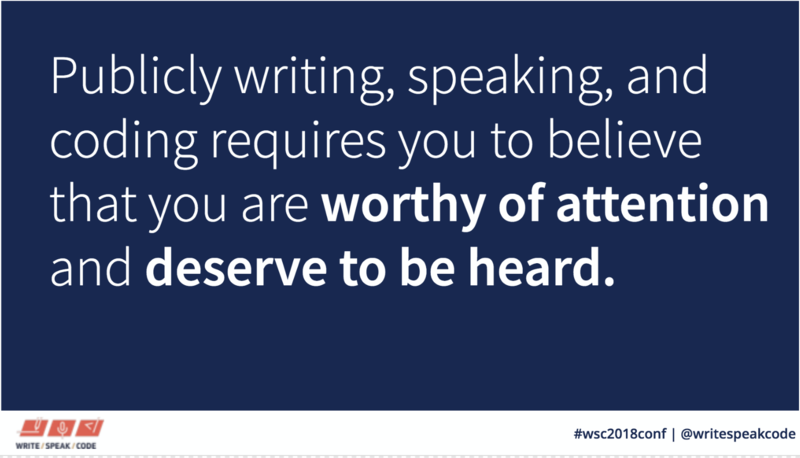 The WSC Sponsorship Prospectus is available online for corporate sponsors. Twitter was rocking at this conference! It’s also a convenient way to get to know others, access resources and take notes. Since not everyone can attend this national conference, the live-tweeting made the conference accessible to folks around the world. I share the sentiment of the below tweeter. In this section, I share some of my favorite tweets from the conference. Show your manager the things you’ve done. Find a way to make these receipts public, like through blog posts.
. @MinaMarkham is giving the most excruciatingly vulnerable talk I have ever witnessed at a “tech” conference, and I feel so grateful to have participated in creating the space to make it possible. #wsc2018conf ❤️ This is why we do the work. It's important to enjoy the moment, b/c many of the people who came before us didn't have the privilege of enjoying the present. They had to spend too much of the time fighting. We owe it to our ancestors and our predecessors to enjoy our lives fully. Chloe Capital: Chloe Capital is focused on early stage technology and tech-enabled companies with talented, hard working, diverse teams. We make seed stage investments in promising companies and use our networks and experience to help them grow. We’re also excited to advance the next generation of inspiring leaders by building a community that offers exclusive access to founder and investor events.